Resources describing volcanism in Yellowstone in a geophysical context. Resources describing surface deformation in Yellowstone. Geophysical information about seismic activity in Yellowstone. 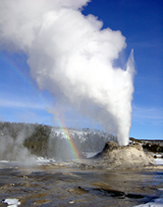 Resources describing hazards in Yellowstone in a geophysical context. Maps describing the geophysics of Yellowstone. General resources describing geophysics in Yellowstone. Additional useful literatiure about Yellowstone.